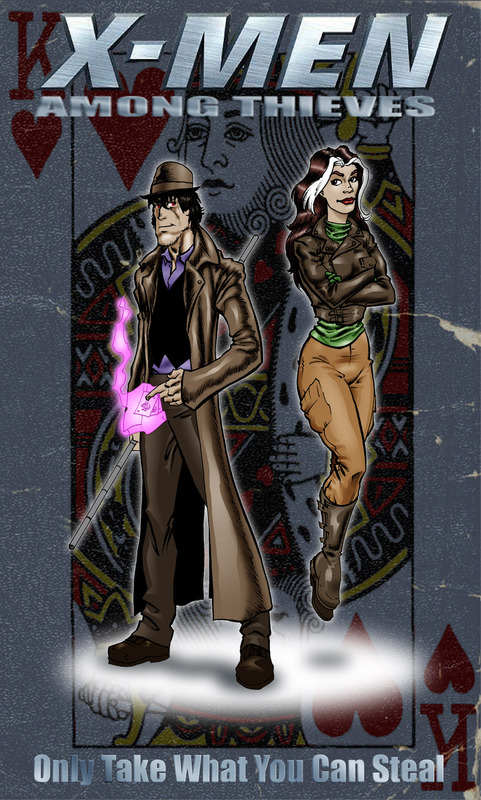 Here is a sneak peak at episode 1X09 “King of Hearts” which airs 11/29/13 and premieres Gambit in my fan fiction series. In an upscale apartment, the bedroom was dark except for light shining through the blinds from the neon signs beyond. A blond woman lay on her bed, hair splayed in a sweaty mess, a slight upturn to her lips. A dark figure moved across the room, the sleeping woman oblivious as she turned and cuddled against the pillow. A King of Hearts appears beside her, and the figure moves out the door, shutting it without so much as a squeak or click. Booted feet move down the stairwell, but again, not a sound was to be heard until a light buzzing echoed off of the beige walls. From somewhere in the maze of pockets specially sewn into the brown trench coat, the man pulled out a cell phone. The caller ID read Helmet Hair. “That’ll cost,” the voice of the figure came across deep, southern fried with a European garnish of smooth velvety chocolate. “I’ll be there ‘fore sun up,” he told the man, clicking the phone off and tucking it into his pocket as keys appeared in his other hand. With practiced ease, the figure straddled the classic Harley then turned over the engine which purred loudly in the moonlight. It caught the attention of a man walking his dog, but all he saw was the tail light as the bike drove off, and the distinctive white Louisiana license plate which read: THECAJUN.